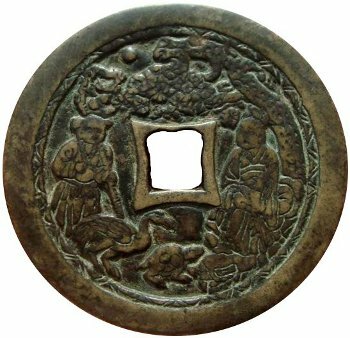 The Chinese have been producing coin-shaped charms and amulets in a variety of themes for more than 2,000 years. One of the most visually appealing types of charms involves scenes of people. Unfortunately, it is often difficult to interpret what historic or legendary scene is being presented. The charm at the left is frequently referred to by Chinese collectors as a “boy under a pine tree” (松下童子) or a “boy worships an immortal” (童子拜仙人). More serious collectors, however, feel that the scene must be an event of special importance. The charm is believed to depict a meeting between Laozi (老子) and Zhang Daoling (张道陵). Laozi, the mystic founder of Daoism (Taoism) and the author of the Dao De Jing (道德经), is shown seated under a pine tree on the right. The “youth” on the left is Zhang Daoling who is clearly carrying a cane or staff. The Chinese word for “cane” (zhang 杖) has the same pronunciation as the “Zhang” in Zhang Daoling’s name and, therefore, helps confirm his identify. Zhang Daoling spent a good part of his life seeking the secret of immortality and there are several symbols which help to reinforce the longevity theme of this charm. Below the square hole are a crane and a tortoise facing Laozi. Both are traditional symbols of longevity as is the pine tree. In the gap above the pine tree can be seen a full moon where the “Jade Rabbit” lives and makes the “elixir of immortality”. According to Daoist accounts, Laozi appeared before Zhang Daoling on “Crane Cry Mountain” (hemingshan 鹤鸣山), in what is now Sichuan Province, in the year 142 AD and proclaimed him the “Celestial Master” who would deliver the people from the evils of the Han Dynasty. Zhang Daoling would subsequently establish the first organized Daoist religious sect known as the “Five Bushels of Rice” (wudou mi dao 五斗米道). 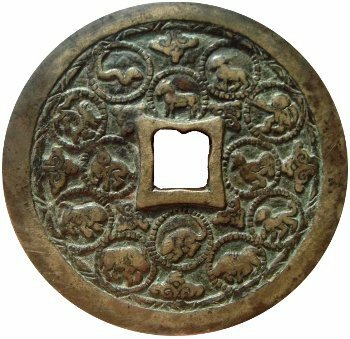 The reverse side of the charm displays the twelve animals of the Chinese Zodiac (十二生肖) with each animal in its own circle. Interspersed among the animal circles are eight “auspicious clouds“. “Eight” is considered a lucky number because in certain Chinese dialects it shares the same pronunciation as the word for “wealth”. The auspicious clouds at the top, bottom, right and left sides of the rim indicate the four directions. The other four clouds are at the protruding corners of the square hole. This charm is particularly well-made and probably dates from the Jin (金 1115-1234) or Yuan (元 1271-1368) dynasties. Another old charm portraying the meeting of Laozi and Zhang Daoling on “Crane Cry Mountain”, but with a different set of symbols, may be seen at Daoist Charms. The reason for this comment is to discover the relevant information as to the value of a Chinese charm I found in South Australia 20 or so years ago while bush walking. This is a large charm about the full width of my palm. One side features the 12 years the other a gentleman holding up a planter with inscription. Can you help ?